Citrus black spot (Phyllosticta citricarpa) is an economically important disease of citrus in Australia. A closely related endophyte, P. capitalensis, also occurs on citrus in Australia, and the two fungi are known to co-exist in orchards. The diversity of other species of Phyllosticta on Citrus in Australia is unknown. Citrus black spot is managed by fungicide treatment and options such as biological control may be better economic alternatives. 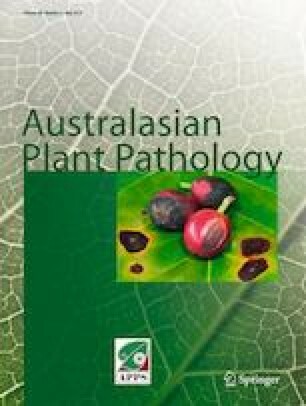 We studied the diversity of Phyllosticta on Citrus in Australia with a phylogenetic species hypothesis. We report P. paracapitalensis for the first time and confirm the presence of P. capitalensis in Queensland. Many examined isolates of Phyllosticta previously identified as P. capitalensis were reidentified as P. paracapitalensis. We also provide evidence through Koch’s postulates that the two endophytic species are non-pathogenic on citrus fruit. In addition, disease incidence and severity of citrus black spot was significantly reduced when fruit were pre-inoculated with one of the endophytes 14 days prior to pathogen inoculation on the same fruit. Our results indicate these endophytes may have potential antagonistic effects against P. citricarpa under field conditions. We thank the University of Queensland for sponsoring N. T. Tran through Ernest Singer PhD stipend and Top-up scholarships, and UQI tuition fee scholarship. Research funds were provided by the Citrus Research and Development Foundation (Grant 715) through the University of Florida and Horticulture Innovation Australia (Grant CT13021). We thank T. A. Shuey for technical support, M. W. Smith and the team at Bundaberg Research Station for their assistance and use of their orchards. Thank you to M. Trott for the use of the orchard in Mundubbera, D. Mayer for helping with data analysis, Y. P. Tan and P. R. Campbell for helping with phylogenetic analyses, and A. R. McTaggart for critically reviewing the manuscript. This research was jointly supported by the Queensland Department of Agriculture and Fisheries and the University of Queensland through the Queensland Alliance for Agriculture and Food Innovation. Funds were also provided by Research and Development for Primary Industries Ptd. Ltd.